In 2004 the Pentagon decided to embark on the development, in fiscal 2007, of an enhanced version of the Standard Missile 3 interceptor. There are three primary differences between the Block IA and IB interceptors. The Block IB will provide a two-color seeker (not the one-color seeker employed on the SM-3 Block IA) and a Throttleable Divert and Attitude Control System (TDACS). It will also include the Advanced Signal Processor to improve the ability of the seeker to distinguish between threat RVs and countermeasures. These improvements will expand the battle space and allow for detection, acquisition and intercepts against more diverse and longer-range threats up to Intermediate-Range Ballistic Missiles (IRBMs). Missile Upgrades for the SM-3 Block IB include improvements to the kinetic warhead's seeker and Divert and Attitude Control System (DACS). Seeker improvements will include the introduction of seeker All-Reflective-Optics (ARO) to improve optics performance, and a Kinetic Warhead Advanced Signal Processor (ASP) to mitigate diminished manufacturing source issues in SM-3 Block IA missiles. Additionally, the increased processing capability of the ASP will support new discrimination algorithms. 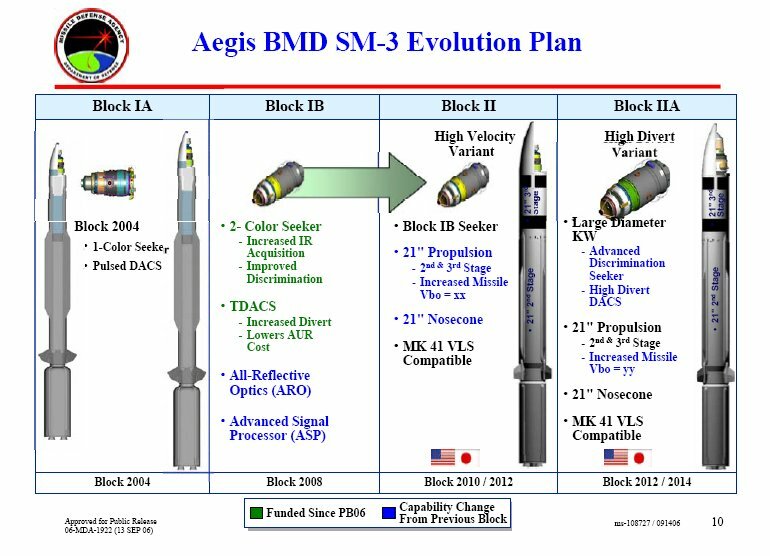 The optics and processing improvements will enhance the Aegis BMD contribution to the BMDS missions by providing greater sensitivity and seeker discrimination capability. Other missile improvements include the integration of a two-color seeker and development of the Throttleable Divert and Attitude Control System (TDACS). These enhancements will be tested and verified for the SM-3 Block IB configuration. The continued design and testing of the SM-3 Block IB components remains the focus of Block 5.0. MDA completed the design efforts for the Advanced Signal Processor and continued development of the TDACS and testing of the twocolor seeker. Additionally, MDA verified, via C2BMC Spiral 6.2, the ability to downselect and forward tracks to Aegis BMD ships for cueing the AN/SPY-1 radar. This is the first step in enabling the SM-3 Launch on Remote ESGs. 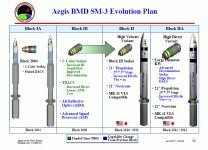 The primary focus in FY08 will be the successful completion of the Critical Design Review with the goal of completing the design and testing for the two-color seeker and TDACS and commencing the element integration of the SM-3 Block IB missile in FY 09. The AN/TPY-2 radar has been delivered to VAFB in order to conduct verification testing and integration of discrimination algorithms, and testing against Targets of Opportunity flights from VAFB. In FY 08, this radar along with critical C2BMC interfaces will be sent to Juneau, Alaska to participate in a GMD system-level flight test (FTG-04) and then returned to VAFB for further testing. The SM-3 Block I interceptors will be upgraded with the SM-3 Block IIA, developed in cooperation with Japan, to significantly extend the battle space and allow engagement of long-range ballistic missiles. In 2006, the United States and Japan signed a Memorandum of Understanding for the co-development of an upgraded, 21-inch diameter SM-3 missile (SM-3 Block IIA). Under the SM-3 Cooperative Development project, the United States and Japan are equitably sharing cost to develop and flight test a missile that will include a significant increase in velocity and range provided by a 21-inch diameter rocket motor, and increased seeker sensitivity and divert capability incorporated in an advanced kinetic warhead. In FY 07, MDA initiated the first phase of the three-phase project and completed a System Concept Review for the SM-3 Block IIA interceptor. Concurrent with design of the interceptor MDA will implement upgrades to the Aegis Weapons System to accommodate the Block IIA missile. In FY 08 and 09, we will conduct the Systems Requirement Review and the System Design Review, with the first flight test initially scheduled for late FY 12. Synopsis HQ0276-08-C-0001 was an update to the presolicitation notice issued by the Naval Sea Systems Command under solicitation number N0002407R6016 on March 15, 2007. This effort is a part of the AEGIS Ballistic Missile Defense (AB) Program and requires continued development, test and production efforts necessary to support test and production schedules of the SM-3 Block IA, Block IB, and Block IIA Cooperative Development (SCD) missile configurations. In addition to the previously synopsized effort for continued systems engineering support, the Missile Defense Agency intends to award a sole source effort to Raytheon Missile Systems of Tucson, Arizona, for the Unitary Kill Vehicle (UKV) and Multiple Kill Vehicle (MKV) development for the Standard Missile-3 (SM-3) Program. The purpose is to develop the UKV and MKV payload systems and integrate the payloads with the SM-3 Block IIA missile in the Ballistic Missile Defense Architecture and develop, within the context of a dual source (Lockheed Martin being the other source) risk reduction effort, concepts for adapting the SM-3 payload design to larger booster candidates such as the Orbital Boost Vehicle and the Kinetic Energy Interceptor booster. This is a collaborative effort between the MKV, KEI, GMD and AB Program elements to ensure the UKV and MKV payloads are developed to a common architecture with common components where applicable. The contractor will continue to provide the necessary engineering services and material for systems engineering, design and development support, fabrication, test equipment support, ground and flight test support, documentation support and assistance in the transition to production for the SM-3 program. Additionally, within the dual source construct, Raytheon may provide like services and materials to the Missile Defense Agency in support of the GMD and KEI program elements. Raytheon Missiles Systems has been the All Up Round Design Agent for all Standard Missile variants since 1966. This contractor is a highly specialized source and only a limited number of other suppliers or services will satisfy agency requirements. As a result of Raytheon Missile Systems involvement in the Aegis BMD Program, it is the only other source that currently possesses the in-depth technical knowledge of the system requirements to satisfactorily perform the work contemplated herein. No other source, other than Lockheed Martin, has access to the proprietary data, resident expertise, and resources to perform the work described herein, nor will any other supplier or service satisfy MDA requirements. This expertise cannot be attained by any other contractor within the anticipated period of performance without incurring substantial costs. The estimated value of this entire effort is 1.4B dollars and the anticipated period of performance is for 5 years after contract award.